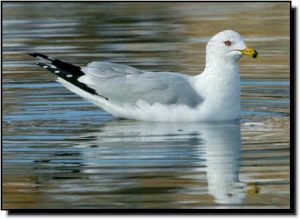 Comments: Probably the most common gull species in North America, Ring-billed Gull numbers are estimated up to 4 million individuals rangewide. They are medium in size. Adults are pale gray along their backs with white heads, yellow legs, pale yellow eyes with a red eye ring and a broad black ring around their yellow bills. They nest on the ground, usually on sparsely vegetated islands in the northern Great Plains. Ring-billed Gulls winter along the coast as well as inland in the southern Great Plains. They forage on lakes and reservoirs, landfill sites and farm fields. Their diet consists of fish, insects, earthworms, rodents, grain, fruit and discarded human food.